Team Germany, helmed by Sebastian Vettel and Michael Schumacher, have romped to a dominant Race of Champions Nations Cup victory for the sixth year in a row. The duo were in peerless form to win each of their head-to-heads throughout the competition, held for the first time in Bangkok’s Rajamangala Stadium, fending off the French team of Romain Grosjean and Sebastien Ogier, in the final. 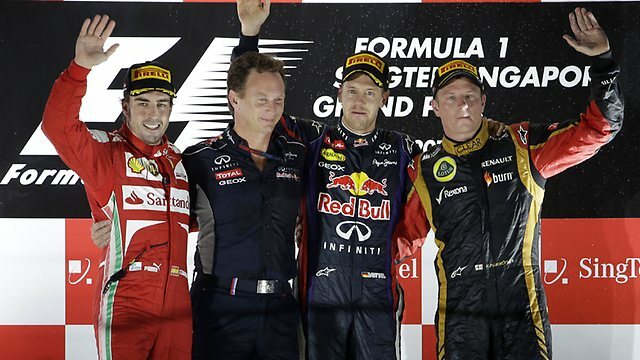 It is the sixth consecutive year that Germany has won the title, each time courtesy of Vettel and Schumacher, and this year’s victory came courtesy of an unbeaten display in the group stages, where it knocked out India and Thailand, before heading off an Australia team comprising of V8 Supercar champion Jamie Whincup and former motorcycle grand prix champion Mick Doohan. Meeting France in the final, after the F1/WRC duo beat the ‘All Star’ line-up of Jorge Lorenzo and Tom Kristensen in their semi, Schumacher first beat Grosjean in the KTM X-Bows before Vettel made victory conclusive by out-performing Ogier. Elsewhere, Team Americas, represented by IndyCar champion Ryan Hunter-Reay and Production World Rally Champion Benito Guerra, and British duo Andy Priaulx and David Coulthard were eliminated during the group stages, along with Team India and Team Thailand. The ‘Champion of Champions’ event takes place tomorrow (Sunday), with Ogier looking to defend his title, while Vettel and Schumacher will return to bid for a first individual victory. Red Bull has the standout budget among F1′s UK-based teams, according to Germany’s Auto Motor und Sport. Citing British companies data, the magazine said Red Bull Technology – the Red Bull Racing parent – had a budget of EUR 245 million in 2011 as Sebastian Vettel sped to his back-to-back drivers’ world championship. Auto Motor und Sport said Red Bull’s budget last year was EUR 42 million higher than in 2010. Brackley based Mercedes, meanwhile, reportedly spent just EUR 145 million in 2011 — a full EUR 100 million less than Red Bull. Lotus’ 2011 budget was a reported EUR 155m, compared to Williams’ 111m. But the news about Red Bull coincides with a fresh wave of speculation in the paddock about the energy drink-owned team’s defiance in the face of the teams-governed Resource Restriction Agreement (RRA). McLaren’s Martin Whitmarsh, however, fell short of accusing Red Bull of cheating. “If they are ahead of us, it’s because they’ve done the better job,” he said.